A crime wave hits the city. The police round up the usual suspects: including you. In order to escape prison, you’ll have to accuse your fellow criminals of the crimes under investigation. Each player is dealt a crime, with an extra crime belonging to the mysterious Crime Boss. Each round, a random crime will come up under investigation. 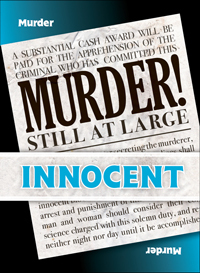 Interrogate and accuse each other to try to figure out who is guilty of the crime, or if it could be the Crime Boss. If you are accused and are guilty, you’re eliminated from the game. If you have an alibi for the crime, you’re given the chance to try and snitch on who you think committed the crime. If you’re snitch correctly, you win, but otherwise, you’re eliminated. 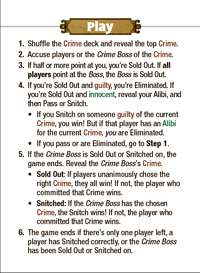 The game ends when someone snitches correctly, all but one player are eliminated, or if anyone is brave enough to try and confront the Crime Boss with his crime. Criminals is an update/re-release of the original version from 2007. 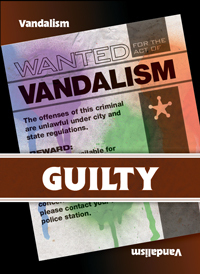 This edition of Criminals features improved game play, heavy development and playtesting, refined rules, and new graphic design of full color cards.